Once we identify an individual's communication skills and preferences we need to be able to record and share the information with others. Communication Passports enable us to do this. They provide a positive, supportive and person-centred approach. 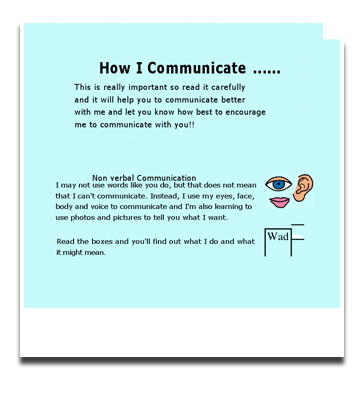 Take a look at this sample Communication Passport and consider how you might adapt this format to create a Passport for a child in your school. It describes a person's 'can do': their most preferred, usual and effective means of communication. It is not a list of 'problems' or disabilities. It helps a person to communicate in the 'wider world'. Important: It specifically belongs to the AAC user. Wherever possible the AAC user should be involved in creating it. Remember, a CP is the AAC user's handbook – not the communication partner's. 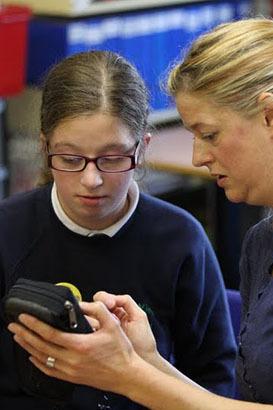 It is an particularly useful device and will enable adult support to communicate appropriately with each child. transitions to new environments and situations. Draws together complex information (to include the person's own views). Is a single document that's clear, positive and accessible. Present the person positively as an individual, not as a set of 'problems' or disabilities. Provide a place for the person's own views and preferences to be recorded and drawn to the attention of others. Reflect the person's unique character, sense of humour, etc. Describe the person's most effective means of communication and how others can best communicate with, and support the person. Draw together information from past and present, and from different contexts, to help staff and conversation partners understand the person and have successful interactions. This text is taken from 'Personal Communication Passports'. Communication Passports have since come to be widely used in home, care, social work, health and education settings. They are a way of making sense of formal assessment information and recording the important things about a child or adult, in an accessible and person-centred way, and of supporting an individuals transitions between services. 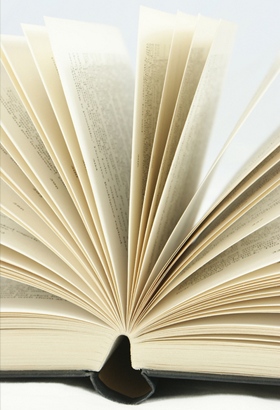 Importantly, they are more than an end-product booklet. Creating a Communication Passport is a process. The decision to create and use a passport gives a clear focus for ongoing home/school liaison, partnership working with families, and for interdisciplinary collaboration. This text is based on 'Personal Communication Passports'. If you want to read more about communication passports, Sally Millar has written an excellent article on the subject.